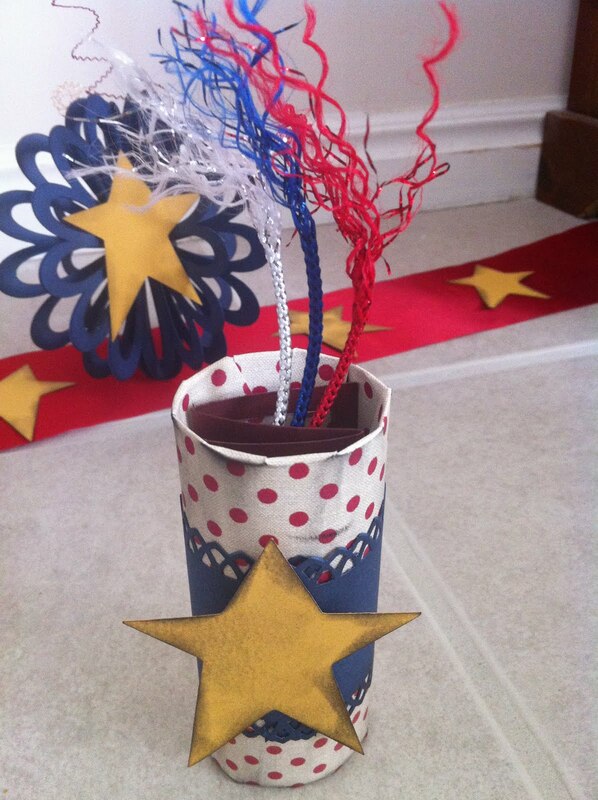 Invitation holder: Cut the empty cardboard roll to 4" size (if necessary) and cover with decorative paper. Make sure to cut the paper 2" longer than your roll. You will want 1" of paper to hang over each end. Cut slits into the paper and glue to the INSIDE of the tube. 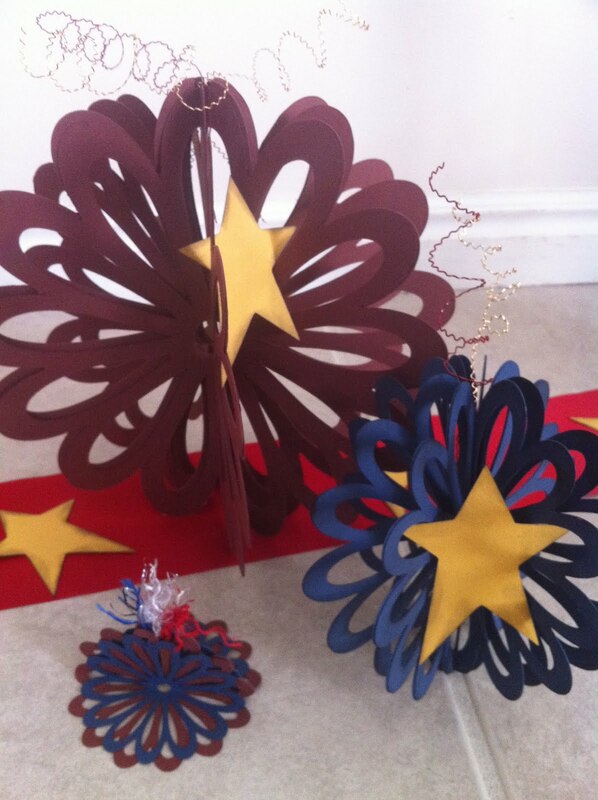 Invitation: Add a piece of blue paper and a star to the outside and ink, if desired. Cut a piece of red cardstock 3.5" X 3.5". Cut decorative piece of paper 3"X3". Ink along all the edges with the black ink. Cut three 3" pieces (one each color) of the craft cording. Fray one end of each color. Adhere the decorative piece onto the solid red piece, but secure the cording at the top, middle edge of the card and between the two pieces. Add party details, fold into thirds and slide into holder. Adhere the red triangle pieces to the blue pieces and set aside. Cut 3 pieces of patterned paper measuring 3"X12". Ink edges. Score each piece all the way across (length wise) at every 1/4". Redirect every other fold backwards so that when you fold it all together it resembles a tightly folded fan (you know the kind of fans we all made as kids with a piece of paper...folding it back and forth, back and forth). When all the folds are completed, smooth flat onto a hard surface and using a glue runner, place glue along ONE of the LONG edges (glue will be running ACROSS each fold). Squish your folds back together and one end will be glued together just like a fan now. Now that you have 3 folded, glued and resembling mini fans, glue the long edges of each piece together so you now have a circular fan. Cut 2 pieces 2"X10" and 1 piece 1.5" X 8". Ink edges. With these pieces repeat steps 4-6 above to create the other two circular fans needed to complete this project. Glue the largest circular fan to the largest triangle, medium on the medium, etc. 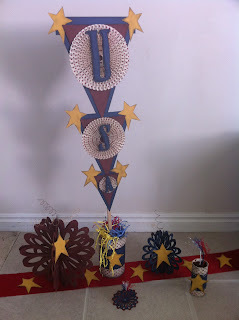 Cut out 2 sets of the "USA" letters. Letter U needs to be 6", S needs to be 4" and the A needs to be 2". Ink edges. 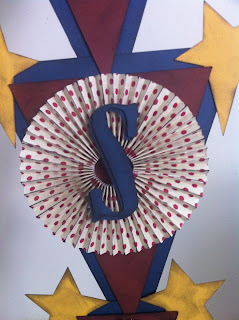 Use the 3-D glue dots to glue the 2 like letters together...you can off center them just a bit as shown in the photo. Adhere onto the top of each fan...U on the large, S on the med and A on the smallest. Cut out 7 stars and ink all the edges. Adhere to the top corners of each triangle piece. Glue triangles onto the dowel in the correct order...U,S,A. 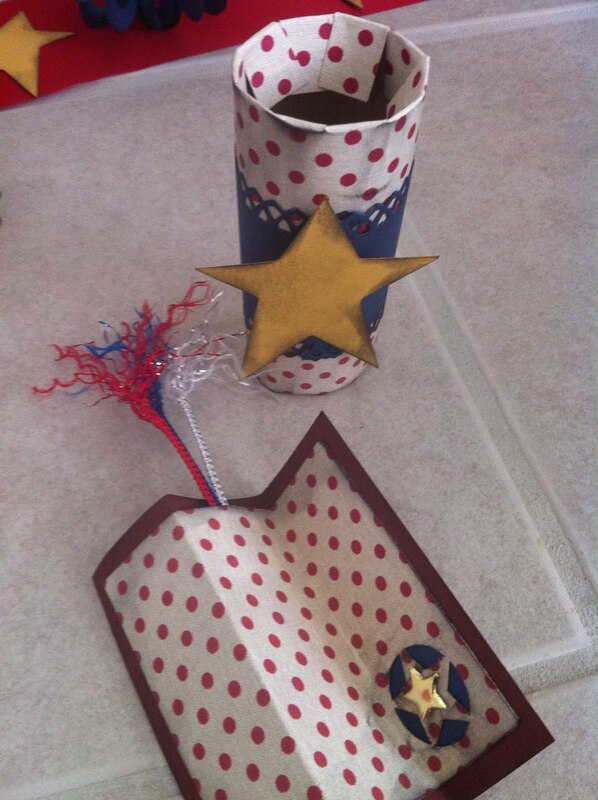 Cover soup can with decorative paper, cut a 4"X3" blue card stock and adhere to the front and finish off with the remaining star. Rocks in the bottom of the can will help it stand on its own. Place bottom end of the dowel into the rocks, fill the can with raffia and you are done! For each 3-D firework, you will need to cut 3, 15" pieces of wire...one of each color. Cut out 8, 8" flowers from red card stock and 8, 6" flowers from blue card stock. Fold each flower in half equally. Make sure you fold each color of flower the exact same way. Place glue all along ONE OUTSIDE of a red folded flower. Adhere it to another red folded flower so that it matches up and glues together perfectly. Continue to glue another flower, and another, etc. until all of your flowers have been added. Glue the last flower to the first to create your 3-D firework. Do the same thing with your blue flowers. Additional sizes can be created as well. Cut out a star for each 3-D firework, ink the edges and add it to the middle of each firework. Secure 3 twisted pieces of wire (one each color) into the top center of each firework.